Eighteen months ago, I devoted blog-space to a very old silent film called Washerwomen on the River (1896). 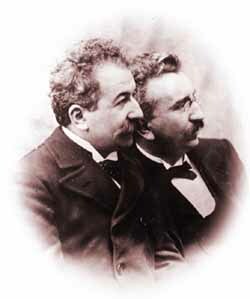 It was my favorite of more than 80 shorts available on Kino International’s out-of-print DVD, The Lumière Brothers’ First Films. I loved it best because, in the span of only one minute, with no movement of the camera, it managed to tell a story. And in so doing, it put the lie to the notion, held by some, that the Lumière’s actualities (documentary films) lacked artistry. Arrival of a Train, another Lumière short from the same year, makes the same overall point. And, it’s a stunning piece of art. A snapshot (almost literally) of a passenger train arriving at a station, and the mass exodus of its ticket holders, Arrival of a Train contains not one but several triumphs of composition. First, the arrival. Like Washerwomen, Arrival’s frame is split into thirds, one on top of the other. In this case though, the middle-third tapers to a point on the horizon just before reaching the left edge of the frame. This is the line of the track, widening rightward along the length of the train station. As the film begins, the train is already rolling into the station, but we see the station for a few seconds first. I find this visual sublime. The train speeds along the middle line of the frame, bisecting it, and obscuring the station. It does this precisely, for it is almost the same height and shape as the building. From our point of view, it is as though the station is a groove, into which the train slides, like a component in a masterfully machined device. The brighter sky and ground, above and below the train, become part of this device too. The world is one object. This isn’t even halfway through the film. Before the train’s wheels have even ceased rolling, the tall side doors and roof hatches of its passenger cars open and heads and bodies appear. These figures are a fair distance from the camera at first, so they are small. But being so small, and so suddenly numerous—and all over the cars, at the sides, on the top—they give an unsettling effect. It’s insect-like. These men and women—wealthy ones, though we don’t know that yet—appear to infest the train, swarming over it like ants overwhelming a bigger bug. Yet it is all orderly. From about the 20-second mark on, the crowd of serious looking men and women in tall hats march past the lens, everyone layered in the semi-formal to formal styles of the time. Many glance at the camera, but they don’t linger, and the image is clear enough, and close enough, for me to say that few of them grin. When I show this film to people, they generally remark on the look of the men—their hats and whiskers. There is this novelty to Arrival of a Train; there is, too, an eerie sense of familiarity with the dead. We’re seeing these people on a normal day, moving as they normally would. We’re connected to them in some way closer to reality than we’d get from an old still photo, for which they would have posed, likely in a very formal way. I was struck, too, by how so many of them exit the train with their heads down, fussing with things like gloves and cigarette cases—looking much as I do, when I check the time on my mobile after leaving a subway car. Arrival of a Train wasn’t the first example of a train on film, not even from the Lumières. But compare it to their Arrival of a Train at La Ciotat, filmed the previous year. The events themselves are similar, and the documentation equally competent. The newer film, however, unifies foreground and background more artistically, using the camera’s position to both merge the train and station and to find the weirdness in a commonplace scene. The distance at which the crowd first appears, and the off-putting look it has, generates a moment of suspense, since we know that crowd is headed our way. Arrival of a Train is more than footage; it is art, and its superiority over Arrival of a Train at La Ciotat is entirely due to aesthetics. I’ve watched Arrival of a Train many times now. The stationary camera, the mechanistic feel of the scene—the flatness of it, as though elements in their differing depths collapse into one—all of this feels more to me like a still photograph than a film, and yet it moves. I don’t know if there’s a word for that. To me, Arrival of a Train is less akin to a movie than a clockwork miniature. Maybe a music box, which, when its lid is opened, produces a little spinning dancer along with the tune. Motion occurs in time, but we feel its boundaries acutely; it is circumscribed in the way all movie action really is. Arrival of a Train is currently available to view on MUBI’s website—free of charge. Check it out while you can. Trains, of course, have always been a powerful image in filmmaking, from the Silent Era on. Check out my post on Daily Violence (2010), a minute-long silent offering a modern take on the chaos of commute by rail. A lot of early films have a sort of eerie quality that comes with what you describe as "familiarity with the dead." It makes you realize how even 2015 will one day be seen as some distant past. That was an interesting comparison to a music box. This is one of the films everyone should see to understand where the movies come from. Thank you for the reference to your post on "Daily Violence." I will never again complain about my daily commute on San Francisco's BART system. Your admiration for the film is infectious. Thanks for the introduction. With shorts this short, the pleasure is in observing every single detail - it's all included for a reason. Thanks for sharing your thoughts on this and Washerwoman, I can't wait to watch them and be inspired! I loved how Martin Scorsese included "Arrival of a Train" in the film "Hugo".